Are you just plain fed up with the constant battle with weight loss? Have you tried to stick to new “diet regimes”, only to give up after the initial burst of enthusiasm- and then felt bad about yourself for not having enough discipline and willpower to see them through? Are you totally confused by conflicting advice in the media? Do you feel unhappy and self-conscious about your body but just don’t know how to sort it out for once and all, in an easy, organised and manageable way? Or do you have a fairly good idea of what you need to do in terms of diet and exercise but just can’t seem to put it into practise? 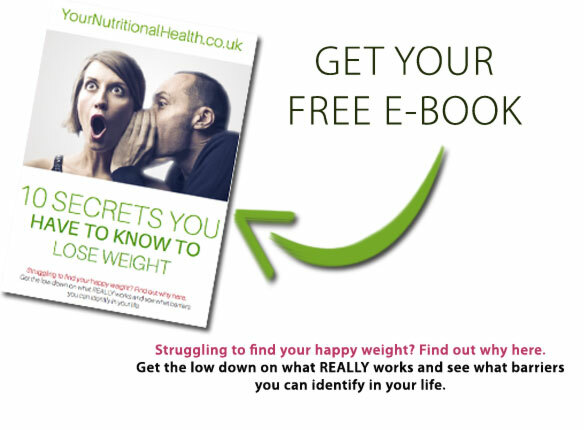 Why is it so difficult to lose weight, even with the overload of weight loss advice and diet regimes on offer? Because there simply isn’t a “single” best way to lose weight!!! How can a single approach work for us all when we each have different health profiles and underlying psychological factors that affect our eating and lifestyle behaviours? A one-size-fits-all approach, or one which just looks at diet and ignores the psychological and emotional aspects of our eating and lifestyle behaviours just isn’t going to work for most people. There’s another factor at play here too: knowing what foods and exercise best suit your needs is quite different to actually putting that knowledge into practise. Information on its own isn’t enough. What makes the difference between knowing what to do and actually doing it is overcoming psychological and emotional barriers that keep you stuck in repeated unhealthy behaviour patterns (that’s the motivational coaching and EFT part), and having accountability to make sure you stick to your goals and stay there. Did you know: Research shows you’ll be 80% more likely to succeed in reaching your goals if we combine nutrition with psychology than just using nutritional advice on its own! My signature weight loss programme teaches you not only what to eat and how to exercise to best suit your needs, but crucially also helps you overcome psychological barriers and keeps you motivated to stay on track. Ready to feel really good about yourself again and take back control over your weight? I would love to help you regain the healthy body you dream of- and your zest for life alongside it! Many people have questions about how my approach can help them. I am very happy to discuss your health concerns and explore ways we can work together. If you decide you’d like to work with me, I’ll tell you the exact steps you need to get going. Please feel free to call, text or email me to book a complimentary 30 minute phone/Skype Weight Loss consultation. You’ll be able to tell me about your current situation and where you would like to be, and I’ll explain how I can help you. We can then see if we’re a good fit. If we aren’t a perfect fit, no problem- I will also be happy to share other resources to help you get what you need. I look forward to speaking with you!